60' Slumber Venture is now offering for a limited time during Summer 2010, we are offering 8 nights for price of 7. Charter Rate $19,000/wk. 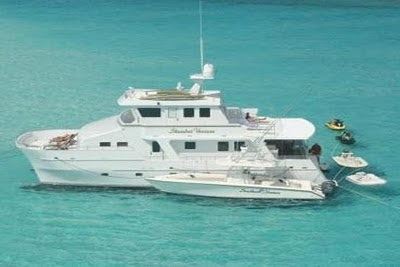 Loaded with water toys, great crew, located Nassau with no delivery fee. SLUMBER VENTURE underwent a major refit in 2007. She accommodates 6 guests in 3 staterooms, of which are all outfitted with queen-sized beds and en suite heads. Each stateroom has full entertainment centers. She offers an array of water toys, large 34' Venture towable tender, 15' Flats boat, (2) Jet Skis, snorkeling gear, (2) kayaks, water pull toys, water skis, and much more. She is equipped with a dive compressor and scuba equipment for CERTIFIED DIVERS ONLY. Her large aft deck is very spacious as she has a 26' beam and is completely shaded for wonderful alfresco dining. Breakfast, lunch and dinner can be served there and you are only steps away from her swim platform to access all of her water toys. Her main salon is very spacious with a 54' Plasma TV with complete audio/video library to sit and relax after a wonderful meal. Click here for more photos and charter availability.